Aviation400 Models: a 1/400 scale, all die-cast metal model of the Boeing B747-230F/SCD in the Tesis Air Cargo Airlines Last Colors Scheme. Reg. VP-BXD. Rel. August, 2009. Aviation400 Models: a 1/400 scale, all die-cast metal model of the Boeing B747-230F/SCD in the Tesis Air Cargo Airlines Last Colors Scheme. Reg. Phoenix Model: one limited edition, collectible die cast airliner model in 1/200 scale. 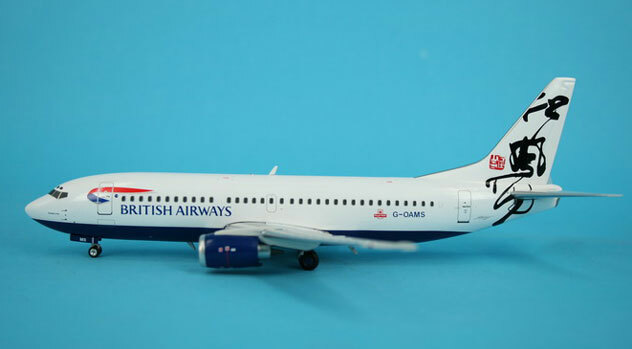 All construction is made of metal, with some plastic parts, of an Boeing B737-4S3 in the British Airways World Tail Blue Poole Colors. Airframe Registration G-TREN. This models is available as of October, 2009. 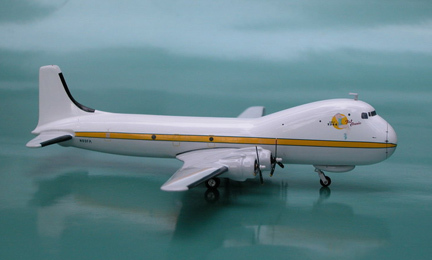 Phoenix Model: one limited edition, collectible die cast airliner model in 1/200 scale. 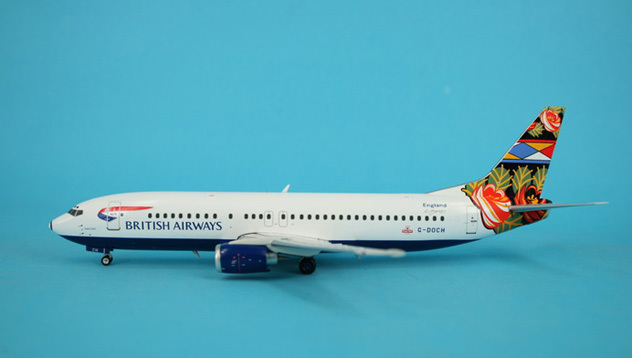 All construction is made of metal, with some plastic parts, of an Boeing B737-337Q in the British Airways Old Rendezvous/Hong Kong World Tails Colors. Airframe Registration G-OAMS. This models is available as of November, 2009. Phoenix Model: one limited edition, collectible die cast airliner model in 1/200 scale. 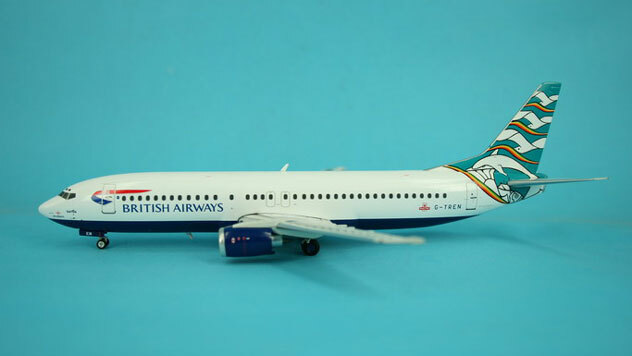 All construction is made of metal, with some plastic parts, of an Boeing B737-436 in the British Airways Old Grand Union World Tails Colors. Airframe Registration G-DOCH. This models is available as of February, 2010. Phoenix Models: one limited edition collectable, die-cast metal airliner model in a 1/200th scale of a Boeing B777-346/ER in the Boeing Company 2002's Special Roll-out Round the World Tour Color Scheme. Airframe Registration N5016R. Model Stand included. This model is constructed of die-cast metal with some plastic parts. This product is available beginning in September 2016. Phoenix Models: one limited edition collectable, die-cast metal airliner model in a 1/200th scale of a Boeing B777-309/ER in the China Airlines Special Spirit of Seattle Color Scheme. Registration B-18007. Chrome Metal Model Stand is included. This model is constructed of die-cast metal with some plastic parts. This product is available beginning in July 2016. Phoenix Models: one limited edition collectable, die-cast metal airliner model in a 1/200th scale of an Airbus A330-343 in the China Eastern Airlines Special Toy Story Colors Scheme. Model Stand included. Airframe B-5976. This model is constructed of die-cast metal with some plastic parts. This product is available beginning in July 2018. Phoenix/Eagle 200 Models: one limited edition collectable, die-cast metal airliner model in a 1/200th scale of an Airbus A330-343 in the Cathay Pacific Airways NEW Revised Color Scheme. Airframe Registration B-LAJ. This model is constructed of die-cast metal with some plastic parts. This product is available beginning in May 2016. Phoenix/Eagle Models: one limited edition collectable, die-cast metal airliner model in a 1/200th scale of a Boeing B777-367/ER in the Cathay Pacific Airways Current Color Scheme. With titles �50th 777-300ER�. Airframe Registrations B-KQX. This model is constructed of die-cast metal with some plastic parts. This product is available beginning in June, 2015. Phoenix200 Models: one limited edition, collectible die cast airliner model in 1/200th scale of an Airbus A340-642 in the Lufthansa Airlines Special 2016’s FC Bayern Audi Summer USA Tour Colors Scheme. Airframe Registration D-AIHK. Model Stand is included. The model is constructed of metal with some plastic parts. This product was released in July, 2016. Phoenix/Eagle Models: one limited edition collectable, die-cast metal airliner model in a 1/200th scale of an Airbus A330-243 in the Etihad Airways NEW Color Scheme. Airframe Registration A6-EYD. This model is constructed of die-cast metal with some plastic parts. This product is available beginning in July, 2015. Phoenix/Eagle Models: one limited edition collectable, die-cast airliner model in a 1/200th scale of a Boeing B777-3FX/ER in the Etihad Airways NEW Color Scheme. Airframe Registration A6-ETA. �This model is constructed of die-cast metal with some plastic parts. Model Stand included. This product is available beginning in November, 2015. Phoenix/Eagle Models: one limited edition collectable, die-cast metal airliner model in a 1/200th scale of a Boeing B777-36N/ER in the EVA Air Airlines Special Color Scheme. With Hello Kitty Logos. Airframe Registration B-16722. This model is constructed of die-cast metal with some plastic parts. This product is available beginning in July, 2015. Phoenix Models: one limited edition, collectible die cast airliner model in 1/200th scale of an Airbus A330-323 in the Air Caraibes French Caribbean Airlines 2010’s Colors Scheme. Airframe Registration F-HPTP. Model Stand included. The model is constructed of metal with some plastic parts. This product was released in July, 2017. Phoenix/Eagle Models: one limited edition collectable, die-cast metal airliner model in a 1/200th scale of an Airbus A330-243 in the Gulf Air Airlines Special �Formula One� Color Scheme. Airframe Registrations A9C-KB. This model is constructed of die-cast metal with some plastic parts. This product is available beginning in June, 2015. Phoenix Model: one limited edition, collectible die cast airliner model in 1/200 scale. All construction is made of metal, with some plastic parts, of an Carvair ATL-98 in the Gator Global Flying Aviation Services Then Current Colors. Airframe Registration N89FA. This models is available as of February, 2007. Phoenix/Eagle 200 Models: one limited edition collectable, die-cast metal airliner model in a 1/200th scale of an Airbus A340-642 in the Iberia Airlines of Spain Old Delivery Color Scheme. With titles Julio Romero de Torres. Model Stand is included. Airframe Registration EC-IOB. This model is constructed of die-cast metal with some plastic parts. This product is available beginning in May 2016. Phoenix/Eagle Models: one limited edition collectable, die-cast airliner model in a 1/200th scale of a Boeing B787-9 Dreamliner in the KLM -Royal Dutch Airlines NEW Color Scheme. With titles Anjer. Airframe Registration PH-BHA. This model is constructed of die-cast metal with some plastic parts. Model Stand included. This product is available beginning in November, 2015. Phoenix Models: one limited edition, die-cast airliner model in a 1/200th scale of a Boeing B787-8 Dreamliner in the LAN Airlines Current Colors. Airframe Registration CC-BBA. This model is constructed of die-cast metal with some plastic parts. This product is available beginning in April, 2013. Phoenix Models: one limited edition, die-cast airliner model in a 1/200th scale of a Boeing B787-8 Dreamliner in the LAN Airlines Current Colors. Phoenix Models: one limited edition collectable, die-cast metal airliner model in a 1/200th scale of a Boeing B787-900 Dreamliner in the LAN Airlines Current Delivery Colors Scheme. Airframe Registration CC-BGA. This model is constructed of die-cast metal with some plastic parts. This product is available beginning in September, 2015. Phoenix Models: one limited edition collectable, die-cast metal airliner model in a 1/200th scale of an Airbus A350-941 in the LATAM Airlines Current Delivery Color Scheme. Airframe Registration PR-XTD. Model Stand is included. This model is constructed of die-cast metal with some plastic parts. This product is available beginning in September 2016. Phoenix Models: one limited edition collectable, die-cast airliner model in a 1/200th scale of a Boeing B777-3DZ/ER in the Qatar Airways Current Color Scheme. Airframe Registration A7-BAM. This model is constructed of die-cast metal with some plastic parts. Model Stand is included. The product was released in January, 2016. 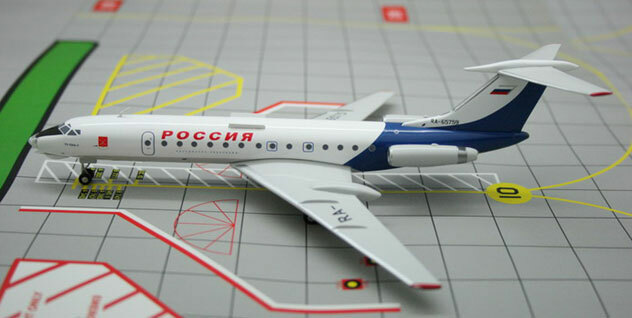 Phoenix Models: one limited edition collectable, die-cast airliner model in a 1/200th scale of a Tupolev TU-134A-3 in the Rossiya Russian Airlines Old Colors. Airframe Registration RA-65759. This model is constructed of die-cast metal with some plastic parts. This product is available beginning in October, 2013. Phoenix/Eagle Models: one limited edition collectable, die-cast airliner model in a 1/200th scale of an Airbus A350-941 in the TAM Linhas Aereas Airlines Delivery Color Scheme. Airframe Registration PR-XTA. This model is constructed of die-cast metal with some plastic parts. Model Stand included. This product is available beginning in November, 2015. Phoenix/Eagle Models: one limited edition collectable, die-cast airliner model in a 1/200th scale of an Airbus A350-941 in the TAM Lineas Aereas Airlines Delivery Color Scheme. With Special Titles Primero A350XWB da Americas. (First A350XWB in the Americas). Airframe Registration PR-XTA. This model is constructed of die-cast metal with some plastic parts. Model Stand included. This product was released in Released in May, 2016. Are you a true Jetcollector looking for DiecastAirplane models or displays? Then you've come to The Airplane Shop with the most to choose from on the web. ADAMJets.com has over fifteen years’ experience servicing the aviation community and CollectableJets enthusiast Worldwide. Nothing but the best AirplaneReplicas available, here you will find one of the best known AirlineMuseum on the web. If you have shopped with any of our competitors, then you know that we can't be beaten. Our combination of large vast inventory, product knowledge, and individualized service, puts ADAMJets.com as the pilotstore stop for any Commercial or military professional flyer, above our competitor. So shop SAFELY and SECURELY to EXPERIENCE simply the BEST service dealer on the Web! All Designated Trademarks and Brands are the property of their respective owners. ADAMJets.com is an independent division of a Florida Corporation. All rights reserved.